Well-designed user interfaces make it as easy as possible for the user to enter the right input in the right format. One of the most effective ways to help a user is to provide suggested input or automatically complete the input that the user begins to type. 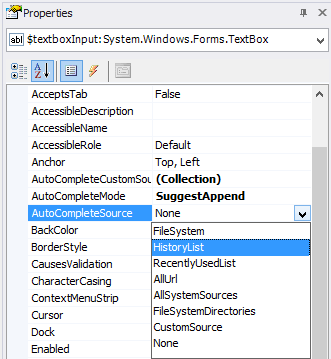 As a UI newbie, I thought that implementing a sophisticated feature like auto-complete was going to be very difficult, but I was surprised at how very easy this task is in PowerShell Studio. Honestly, I set aside a week to do this and it took me 10 minutes – 30 minutes with testing and polishing. I couldn’t believe it. 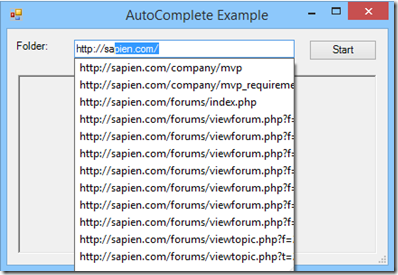 Remember that auto-complete doesn’t constrain or validate the values that the user types. To constrain values, use a ComboBox control. For information about validating form input, which is a critical topic, see our four-part series, beginning with PrimalForms 2011: Validating the Form – Part 1. 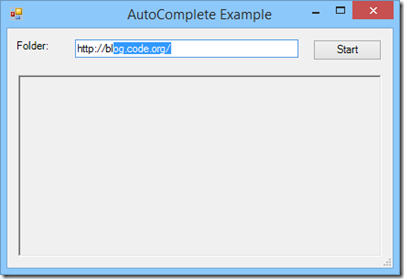 And, for fundamentals, see the Spotlight post on the TextBox control. Add a TextBox control to your form. 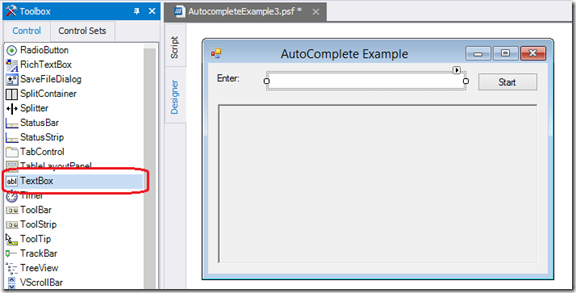 When you run the PSF file, the form has no auto-completion features. The experience is like typing in Notepad. 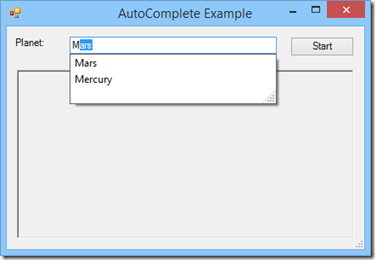 To enable AutoCompleteMode, set the value of AutoCompleteMode property of the textbox to Suggest, Append, or SuggestAppend. 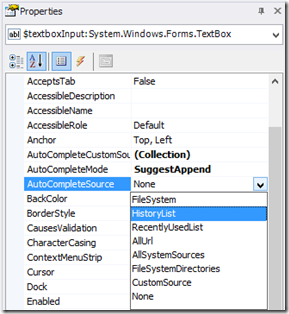 You can do this in the Properties pane for the toolbox. Or, in your script. 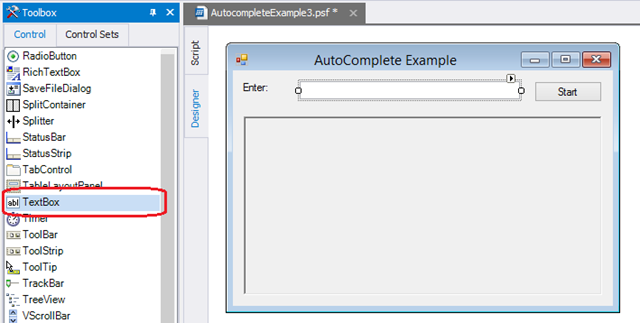 The script is the best choice when AutoCompleteMode is not enabled by default, or only conditionally, but if you enable it in form_Load, the effect is the same as enabling it in property pane. 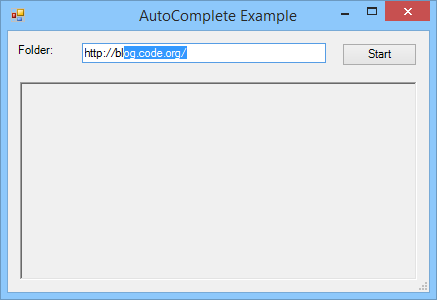 The AutoCompleteSource property determines the content that is automatically completed in the textbox. Windows Forms provides six preset sources and includes a option for custom sources. 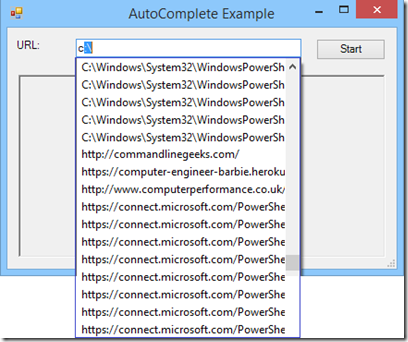 For information about the preset sources, see AutoCompleteSource Enumeration. 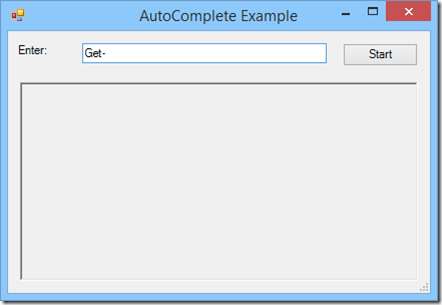 The value of AutoCompleteSource has no effect when AutoCompleteMode is set to None, so remember to set both properties. 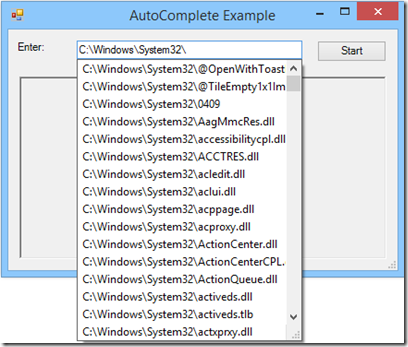 If you’re using a preset auto-complete source, you’re done! That’s all that’s required for auto-complete. Here’s the experience. 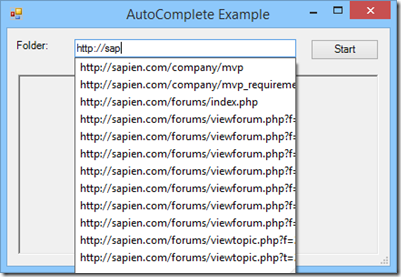 These preset sources auto-complete URLs in the browser recently-used URL list, its history list (cached URLs), or both (AllUrl). The FileSystem and FileSystemDirectory sources complete file paths. FileSystemDirectory completes only directories. FileSystem completes both files and directories. AllSystemSources combines AllUrl and FileSystem. It completes URLs, files, and folders from all sources. The preset sources are very simple, but custom sources aren’t difficult at all. Just remember that the sources must be string values. 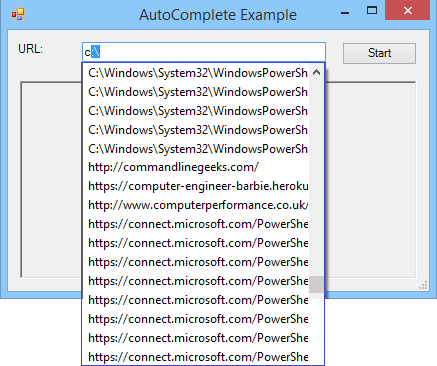 In this example, I want users to enter the names of Windows PowerShell commands in the input textbox. 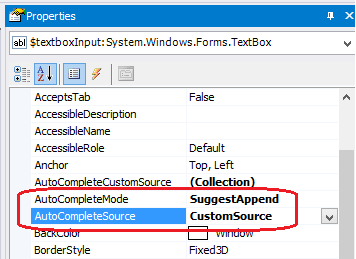 In the properties pane for the textbox, I set AutoCompleteMode to SuggestAppend and AutoCompleteSource to CustomSource. 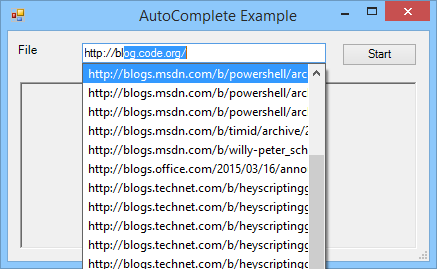 In my script, I use the Get-Command cmdlet to get the commands and its CommandType parameter to exclude aliases. (I have code to handle aliases, but I don’t want to encourage their use.). To get string values, I get the Name property of each command. Then, I save the results in the $cmdList variable. 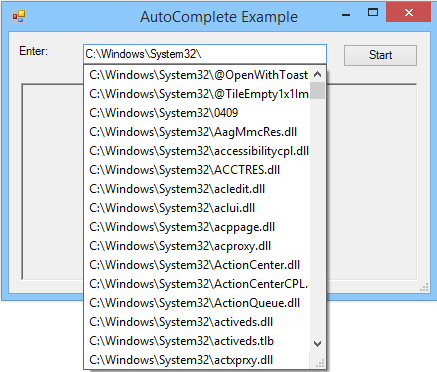 Then, I set the AutoCompleteCustomSource property to the value of $cmdList. The value of AutoCompleteCustomSource must be a StringCollection, so I use the AddRange method of StringCollection instances to add the values in $cmdList to the auto-complete source. Done! 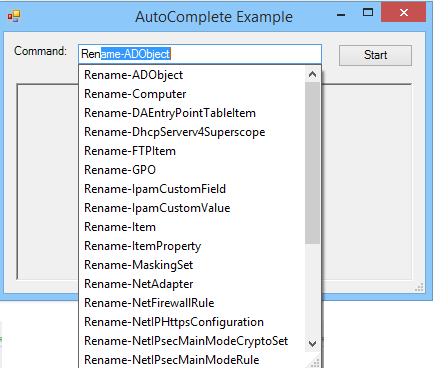 Now, when I use the form, the command names are auto-completed. 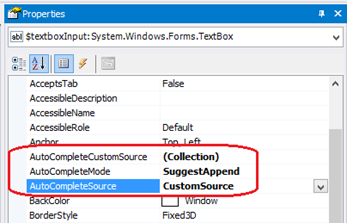 You can also add a fixed collection as a custom source. 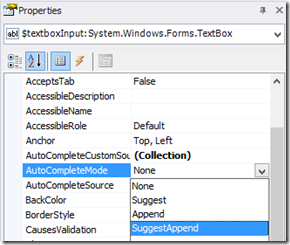 Typically, if you want to present a fixed collection, you use a ComboBox control, but just to be complete, I’ll show you how it’s done with a textbox. In this example, we’ll use the names of planets as a source. For scientific accuracy, I’ll omit Pluto, with nostalgic regret. 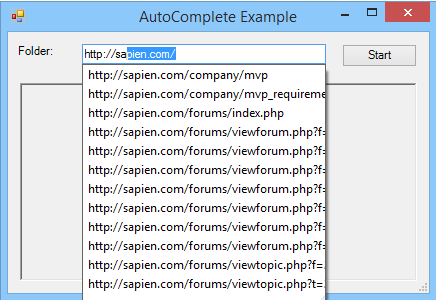 Then, I click the ellipsis beside AutoCompleteCustomSource. 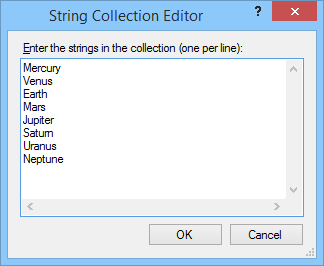 In the StringCollection Editor box, I type the names of the planets. 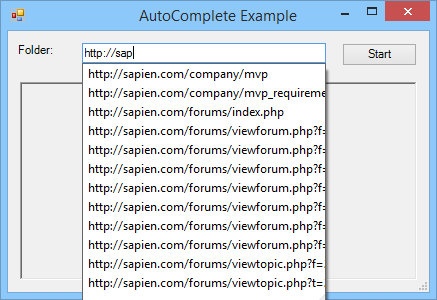 You can also populate the AutoCompleteCustomSource in your script. The effect is the same. 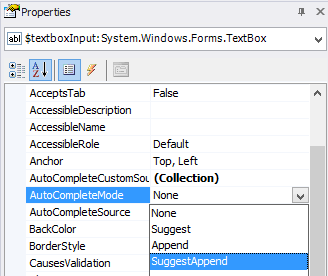 To finish, let’s look at the AutoCompleteMode property values: Suggest, Append, and SuggestAppend, which combines the first two. 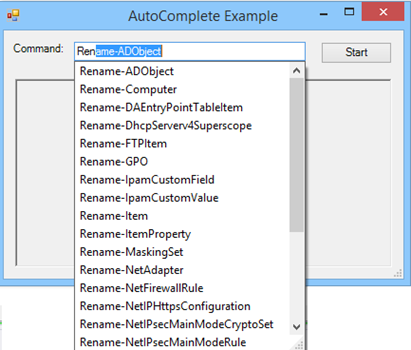 You can read the definitions of the AutoCompleteMode property values, but you need to touch it to see the effect. For me, the best part about implementing auto-complete in my GUI app was the small investment of time and huge payback. June Blender is a technology evangelist at SAPIEN Technologies, Inc. You can reach her at juneb@sapien.com or follow her on Twitter at @juneb_get_help. 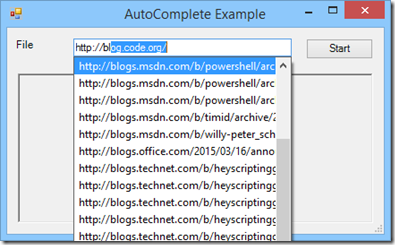 What’s new for PrimalPad 2015? is there a similar possiblity to auto-complete when typing the value starting , as an example, with 3rd or 4th letter? Maybe to bring a selection for all values having the typed letters included? I’m not sure, Christian. That’s more like regex, wildcards, or globbing. I’ll ask and have someone reply. If anyone else here knows, please post. Thanks! Hi, Christian. I checked with the smart folks. 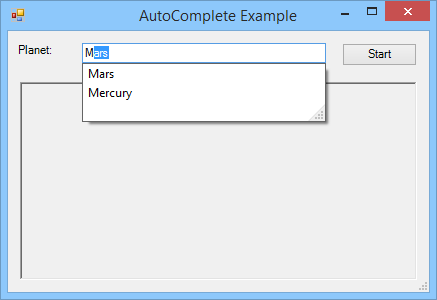 You can set up your custom auto-complete to match any values, including predictable values within a string. It won’t really match values within a string, but it will behave as though it does. Here’s a blog post that shows how it’s done.